Both interactive and PDF maps have been redone and updated! The interactive map is a new, completely redesigned application with smoother interaction and better ability to view on a tablet or smartphone. The PDF is now interactive and "layered" which means you can, in a current version of Adobe Reader, turn on or off any of the map layers and see/print what you want. Download metadata (.htm), spreadsheets (.xlsx), and compressed shapefiles (.zip) below. Shapefile Projection: North American Datum 1983, UTM Zone 17 North, Transverse Mercator. A ''.prj'' file is included in the shapefiles zip folder. Data files include bottom-hole information (Bottom Hole Flag, Bottom Hole Location), and data for completed wells include 2013 production information. 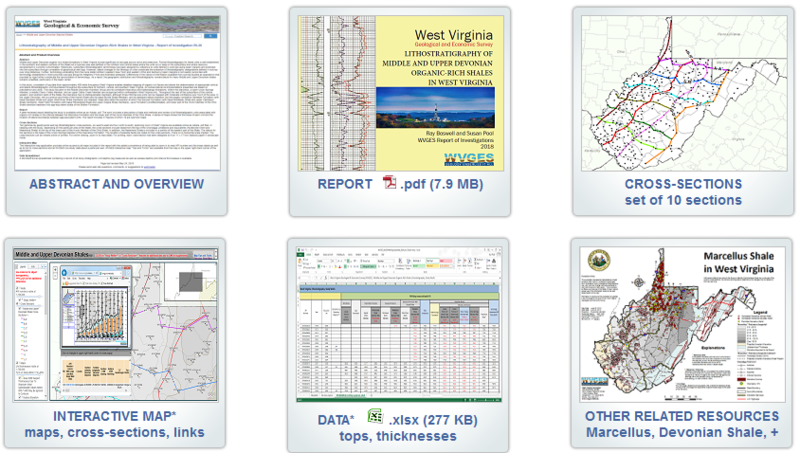 This Excel workbook contains six spreadsheets with information about horizontal and vertical wells drilled to or through the Devonian Marcellus Shale in West Virginia. Sheets 1 through 4 contain a description of the data fields and the completed, permitted, and cancelled well files, respectively. The sheet of completed well data also contains annual gas and/or oil well production data as reported by operators since 2005, in addition to natural gas liquids since 2013. Vertical wells contain commingled production if zones in addition to the Marcellus have been completed. Sheets 5 and 6 have a description of the records and the data, respectively, with monthly well production data for gas, oil, and natural gas liquids. Well locations are in decimal degrees and UTM coordinates (NAD83, UTM Zone 17 north) for users who wish to create their own GIS shapefiles from the data. This Excel worksheet contains a list of wells penetrating the top of the Onondaga Limestone or deeper for which WVGES has scanned e-logs. The Marcellus may or may not be present or recorded on the log. Note that an unconformity exists between the younger Rhinestreet black shale and the Onondaga Limestone in portions of Cabell, Mason, McDowell, Mingo, and Wayne counties; the Marcellus and other Hamilton Group shales are thought to be missing in these areas (see Schwietering's maps below). The individual scanned TIFF images for these logs are available for free downloading through the interactive map application and at www.../welllogs; the associated well data are available on our online "pipeline" data application at www.../oginfo/pipeline/pipeline2.asp. 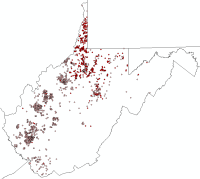 This Excel workbook contains data on horizontal wells drilled in West Virginia. The first spreadsheet in the workbook is a description of the data fields contained in the following two sheets: "Completed Horizontal Wells" and "Permitted Horizontal Wells". While most of the records in these files represent horizontal completions or planned horizontal completions in the Marcellus and Lower Huron shales, more than 17 other formations are also represented here. Note: ''Operator Name'' is the operator who drilled the well or owned the well at time of completion. This may or may not be the same operator who reported production for the well, as the well may have been sold after it was completed. In the data sheets, zeroes represent values submitted by the operator as zero values, whereas blank (null) fields were not reported or submitted. The spreadsheet data are refreshed weekly to reflect updates added by staff to the database during the week. Latitudinal and longitudinal values and UTM coordinates (for NAD 83, UTM zone 17 north) for the surface location of the vertical bore are included in the well data. 2013 to present are on our Posters and Presentations page. Two chapters in the 1996 Atlas of Major Appalachian Gas Plays (John B. Roen and Brian J. Walker, editors, 1996, WVGES Volume 25) address Devonian shales. The chapter on Upper Devonian black shales includes a discussion of the Marcellus Shale, the deepest of the Devonian organic-rich shales in West Virginia. A chapter on Upper Devonian fractured black and gray shales and siltstones addresses the more eastern and northern of the shales in the state. This publication is available from the WVGES publications sales office. 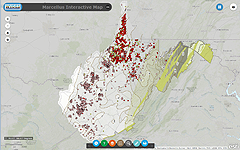 See Atlas of Major Appalachian Gas Plays for the publication description. Please click here for a PDF of our publications order form , or call Pub Sales at (304) 594-2331 to order a copy. U.S. DOE Report (2013): Modern Shale Gas Development in the United States: An Update, shale-gas-primer-update-2013.pdf (PDF, 12.59 MB). 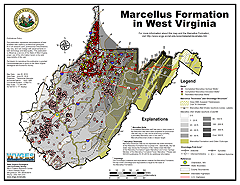 U.S. DOE Report (2010): Projecting the Economic Impact of Marcellus Shale Gas Development in West Virginia: A Preliminary Analysis Using Publicly Available Data, ALL-DOE_WV_MarcellusEconomics2010.pdf (PDF, 2.22 MB). U.S. DOE (2007): Archive of Unconventional Gas Resources Program or Natural Gas Program Archive, a compendium of pioneering research over two decades (1976 to 1995) by the Department of Energy's National Energy Technology Laboratory (DOE/NETL) funded by the U.S. DOE and the Gas Research Institute (GRI) (now the Gas Technology Institute [GTI]). This archive includes nearly 1,500 valuable documents scanned and available in two compressed (.zip) files. 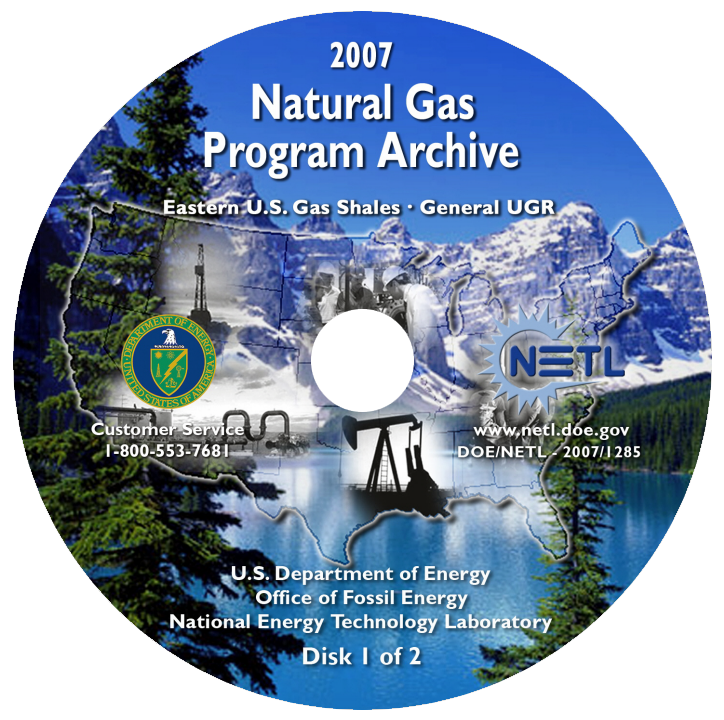 The first file ('Disk 1') contains reports and logs related to the Eastern U.S. Gas Shales Program (1976-1992). Much of the earlier work emphasized the Lower Huron shale, the primary productive zone in the historic productive area (e.g., the Big Sandy field of southwestern West Virginia and eastern Kentucky).The second file ('Disk 2') combines program information related to Western U.S. Gas Sands (1977-1992), Methane Recovery from Coalbeds (1978-1982), Methane Hydrates Program (1982-1992), Deep Source Gas Project (1982-1992), and Secondary Gas Recovery (1987-1995). Both include a comprehensive summary of the Unconventional Gas Resources Program and an extensive bibliography dedicated to each of these programs. This archive was originally published as a 12 CD set and then as a 2 DVD set before being available for direct download from DOE from this CD/DVD Retrieval page. 2011, Coleman, J.L., Milici, R.C., Cook, T.A., Charpentier, R.R., Kirschbaum, Mark, Klett, T.R., Pollastro, R.M., and Schenk, C.J., Assessment of Undiscovered Oil and Gas Resources of the Devonian Marcellus Shale of the Appalachian Basin Province, USGS Fact Sheet 2011-3092, 2p., pubs.usgs.gov/fs/2011/3092/. 2006, Milici, R.C. and C.S. Swezey, Assessment of Appalachian Basin Oil and Gas Resources: Devonian Shale—Middle and Upper Paleozoic Total Petroleum System, USGS Open-File Report 2006-1237, pubs.usgs.gov/of/2006/1237/. 2005, Repetski, J.E., R.T. Ryder, K.L. Avary, and M.H. Trippi, Thermal Maturity Patterns (CAI and %Ro) in the Ordovician and Devonian Rocks of the Appalachian Basin in West Virginia, USGS Open-file Report 2005-1078, pubs.usgs.gov/of/2005/1078/. 1993, Petroleum Geology of the Devonian and Mississippian Black Shale of Eastern North America, USGS Bulletin 1909, J.B. Roen and R. C. Kepferle, editors: pubs.er.usgs.gov/usgspubs/b/b1909. A portion of this work was supported in part by RDS Agreement 41817M4160 and the U.S. Department of Energy Contract DE-AC26-04NT41817.630.01.14. Page last revised December 4, 2018.